January has seemed to flip past and it seemed that not a lot had been achieved. Time to stop and consider that what seemed to be a lot of “Nana” napping due to the heat and time out, had actually achieved some results. Things did get created, even finished and better still some new ideas took shape. 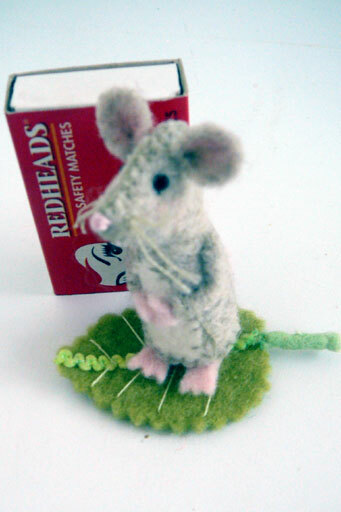 For instance this donsey of gnomes, miniature ones, and a tiny felt mouse found their way into form during January. As did the frogs and tadpole and the tiny Waldorf babies of previous posts . It was also a month where art became the focus and experimenting with different media as in the programme Paint – but those efforts I’ve yet to be able to share as they are in the wrong format and I am still trying to work that out. 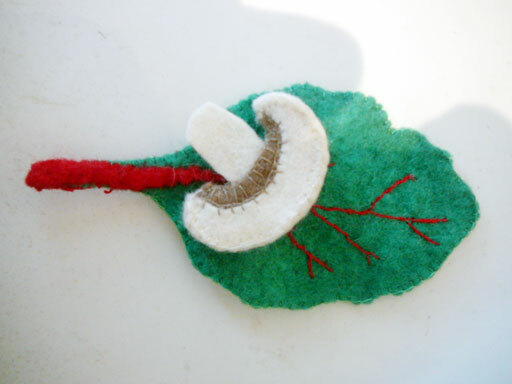 There was also a little episode of making felt food. At first to patterns that needed to be tried when a kind friend ordered a Japanese craft book for me. That was such an inspiration and motivation as it made me really look at food, observe closely, understand , experiment and motivate me to create my own interpretations. As a consequence this mushroom slice and Rainbow Chard leaf resulted and there are several sketches for other items . It was a pleasant surprise to take a step back and survey the results and realise that things have been progressing, slowly but steadily. I guess if one were to draw on old wisdom it was a situation akin to the hare and the tortoise. My feeling pressured to be the hare and expect faster results led me to overlook that by being the tortoise and taking one sure step at a time results were forthcoming and goals had been reached. It also led me to ponder over the ancient fable and the wisdom offered. Modern thinking seems to have allocated a wiley and cunning nature to the tortoise who sometimes hitches a lift with the unsuspecting hare, who is depicted as being as brash, ego centred and overconfident. The suggestion is that by being devious and honing in on the opponents weakness you can win. This seemed so misunderstood as the whole point is to show that by setting a goal through perseverance and determination it can be achieved. At school we were always told that “slow and steady wins the race”, whereas now there seems to be a drive for faster, instant results without taking into consideration the effects and consequences of a power driven, “more and more ” approach. Everything seems to need to be statistic driven; higher scores , pretty pie charts, statistics of statistics, goals, outcomes, interactions gets reduced to numbers and graphs. Do they really mean anything other than aiming for profits and manipulating these figures to justify a consumer driven economic policy, where more and greed are good and a simpler and slower pace that concentrates on quality of outcomes, using what is on hand and supplying needs rather than wants are seen as hindrances. The most recent interpretation of the classic is to offer the Compound Effect. In this explanation the two opponents join forces, become a team and get even greater, faster, more efficient results. Specialising and co-operating, takes the story to a different level, more positive yet still aimed to get higher production. It sees fast as the core to success and efficiency. As a tool for society cooperation seems an excellent outcome, especially if we are to address to problems facing the planet and come up with effective solutions, but rather solutions to encourage peace and sustainability than growth for growth’s sake. Applied it seems to lead to cutbacks and inefficiencies, loss of services and a rationale that boosts share prices. However, this approach seems to me to miss the point of the fable entirely. The ancient wisdom is not about mass production or team effort but rather to point out that determination and focus can produce amazing results that would seem to most onlookers to be unachievable as well as the more humble personal outcomes that often slipped past unnoticed and unacknowledged. It also points out that by going full steam ahead and not using our energy wisely we can burn out . So now I have come full circle and back to stitching in peace, slowly savouring each stitch with joy knowing that my creations are not to be a statistic but made with love, and a need to create and share. I savour the slower in and out, the sound of the thread slipping through the fabric, the feel of the cloth, the gentle rhythm and the connection it has through time hoping that what I create will be imbued with all these and the joy shared with the recipient. Ror a moment sharing the soggy conclusion to the month, as the aftermath of cyclone Oswald wreaks devastation in many places along the East Coast of Australia. Queensland and N.S.W have suffered terribly yet this disaster has brought to the surface a true spirit of co-operation, great resilience and will to overcome. 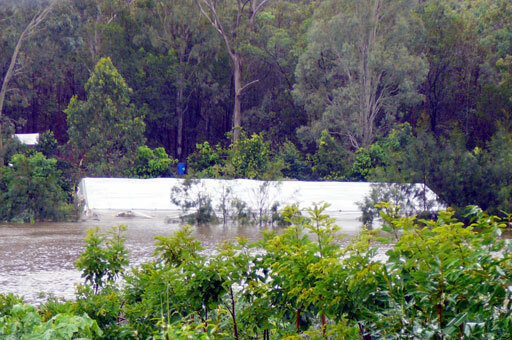 Going under as water levels rise , a scene in the next road down from ours. I hope all is well with you Christina. Those floods look awful on the tv – are you affected by them? 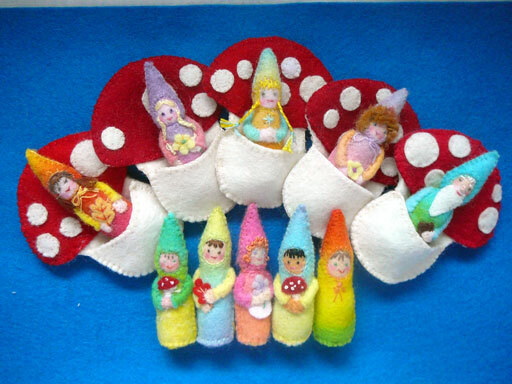 Such adorable gnomes. I love their colors. 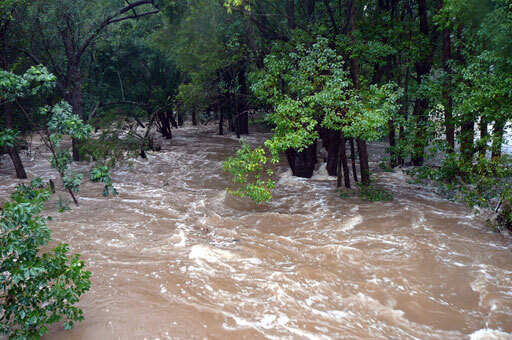 Oh my, that water looks nearly as scary as the fires seemed. Extremes are so scary…in so many ways. 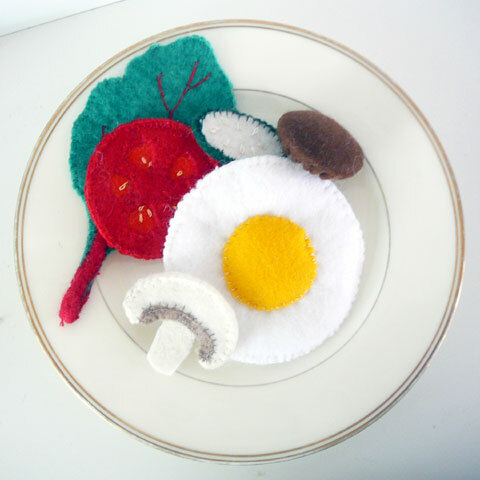 I love the felted food. Perfect idea for my grandsons playhouse. Oh, those floods are really scary. But your felting is just amazing. How I love those sweet little gnomes – and I think I can almost taste that perfect leaf of chard! You’re little mousie is so cute! Thank you for linking up to Waldorf Wednesday. Hope to see you back this week!